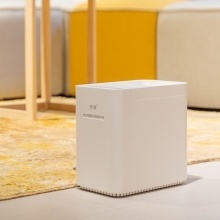 Xiaomi Mijia Evaporative Humidifier humidifies the air in the room during summer and winter, refresh the quality of air we breathe, adjusts the temperature in the room. 600ml/h Humidifying Capacity: adopts advanced PCE-DCT dynamic thermal compensation technology to guarantee the efficient water evaporation. No White Mist Output: One-button easy operation, more healthier for the pregnant, baby and sensitive people. Anti High Temperature Material: Support for adding boiled water and other kinds of water, sterilizing inner sink and cleaning easily. Smart Mi Home App: Smart operation for choosing more scenes you want and meeting your other needs. Mute & Energy-saving: The power of the Mijia Humidifier is lowest down to 5.8W, noise reduction is less than 48.7dB. Multi Protection For Safe Use: Four-layer protection: Auto-power off without water, stop working when opening the cover, water overflow protection, children lock. 1. Please search and download the " Mi Home " APP on the Google Play or Apple Store.